If you would like to become a member of the Northern Newfoundland Club then please click the link below to access the Application Form. This will need to be completed and posted to the Membership Secretary. Please note Paypal cannot be used for Membership Applications. If you haven't already renewed your membership, you can now renew using Paypal. Unfortunately there is a small surcharge of £2.00 on Joint, Single and Junior Memberships to cover the fee that they charge us. Water & Draught Tests are being held at Rudyard Lake on the above dates. Entries and fees to Paul & Ruth Dickinson. The Kennel Club awarded the trophy pictured to the NNC Welfare stall at Crufts. 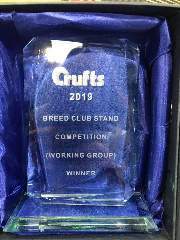 Michelle Jenkins, NNC Welfare Coordinator said "We were overwhelmed when presented with the trophy on Friday for best breed stall in the working group." Ruth Dickinson has done a fantastic job preparing and selling our merchandise. 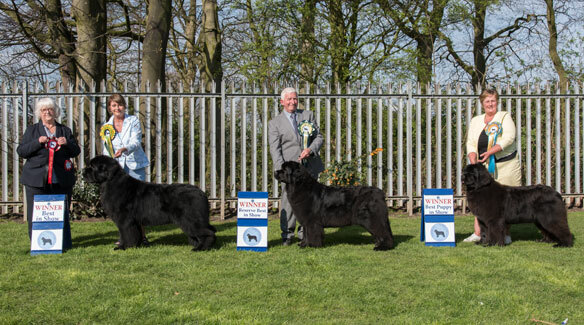 The NNC Champ Show was judged by Mrs Lucinda Burgess; We had an excellent entry of dogs, their was a very friendly atmosphere and the show was very successful. All results & photos are now online. Critiques will follow once available. 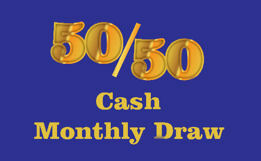 Our monthly prize draw for participating members aims to raise extra fundsfor the club. Congratulations to our January winner, Stewart Wilson (£13) and our February winner, Christine Pritchard (£11). "Remember, you have to be in it to win it!" The NNC would like to make a commemorative cloth to celebrate all the affixes of today and yesteryear. This cloth will be displayed at NNC events (Showing & Working) throughout the year. Please support this great idea. 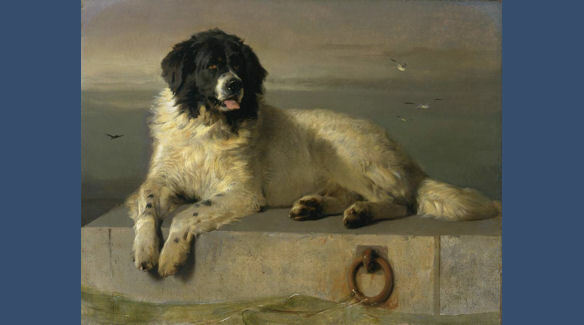 As you will all be aware on the 25th May 2018 the new requirments of GDPR came into effect and as such it is necessary for each member of the Northern Newfoundland Club to provide permission for their data to be used for membership purposes. The link below will take you to the form that will be provided in the next edition of the Newfletter. Welfare Still Needs Your Help! 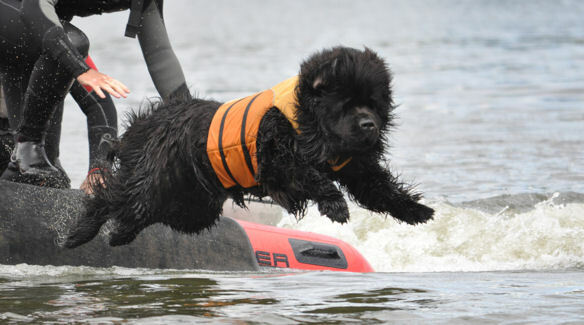 As you know the Northern Newfoundland Club Welfare believes that we all have a responsibility to rescue dogs in need; to educate the public about the desirability of adopting Newfoundlands as companions and family pets in the home. None of this would be possible without the generous donations of money that we receive, and therefore we are appealling to you all to help by making a donation to NNC Welfare. To find out more about the work and some of the costs involved, click the link below. Our members and visitors to this our Club website are vitally important to our fund raising efforts therefore we have decided to raise the profile of Welfare by including below a new Welfare Paypal donation facility. We would be most grateful for any donation, however small. 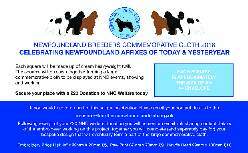 Do you want to help raise funds for the Northern Newfoundland Club? Every penny raised is most appreciated. 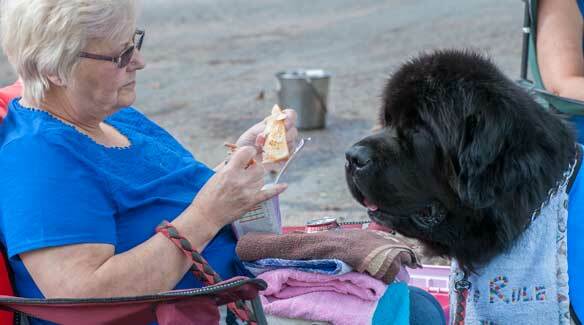 Do you own a Newfie that has reached the ripe old age of 10 years or more? If so then why not apply for a 'Golden Oldies Certificate'. 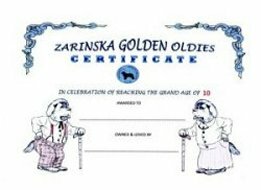 These certificates are kindly provided by Barbara Nadolski of Zarinska Newfoundlands. Proof of the dog's Date of Birth will be required. Please contact Barbara directly by phone or email. A new book for Newfie lovers is now available - This is the first book of adventures of Benny & Billy that can be ordered online here. This book will make an excellent gift for Christmas or just to add to your Newfoundland book collection. 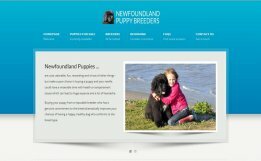 The Northern Newfoundland Club has recently launched a new website for breeders and puppy buyers. 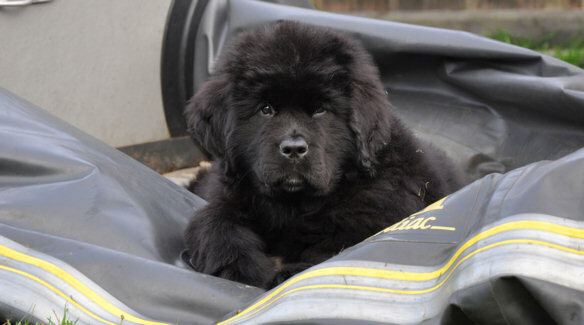 The primary purpose of this web site is to put potential Newfoundland puppy buyers in touch with reputable and recognised breeders by steering them away from general online puppy sites (e.g. Epupz, etc). The Northern Newfoundland Club Welfare have teamed up with a recycling firm who deal with mobile phones, ink, lazer and toner cartridges. For items recieved they will donate money to NNC welfare. Click on the logo to be taken straight to our page on the Recycle for Charity web site where you can enter your details to recieve a freepost envelope in which to send your recyclable items - you can put up to 5 mixed items in each envolope. If you are unsure if your items can be recycled you can check when you are on the recycling page. 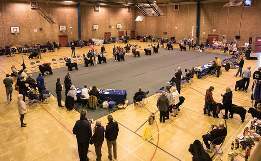 There will be large collection boxes and freepost envolopes available from Welfare volunteers at certain events but you don't have to wait, get recycling now and help to raise much needed funds for the NNC's welfare work.